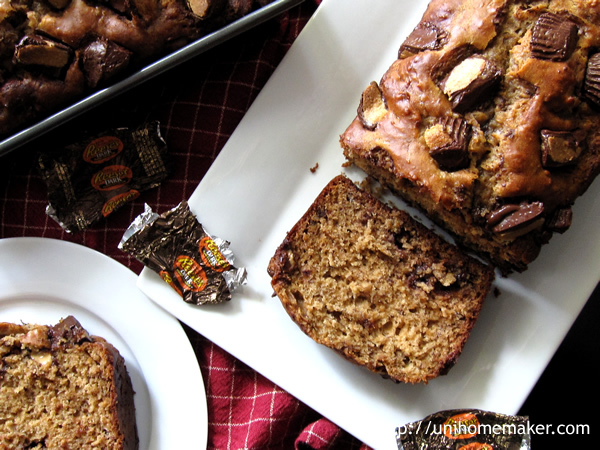 Peanut Butter Cup Banana Bread + Giveaway! 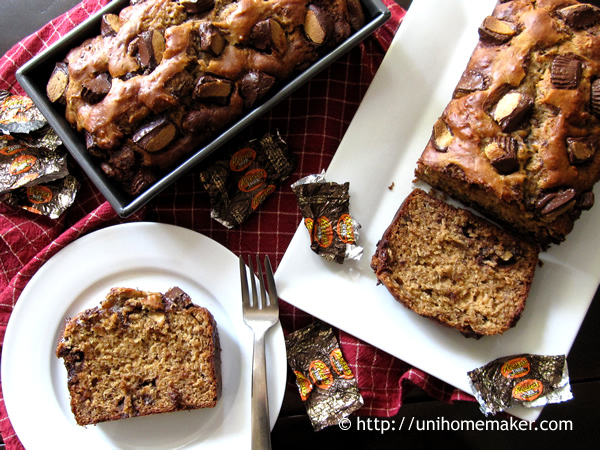 I had some ripe bananas I wanted to use up but I didn’t want to make just banana bread. I also had some milk and dark chocolate peanut butter cups on hand too. Which makes for a nice jazzed up banana bread! And who doesn’t like peanut butter cups? This post today marks my 100th post and in celebration of that, I’m hosting a giveaway to all my existing and new readers. Everyone likes shopping right? Whether it’s clothes, food, or something for the kitchen. And everyone likes Sur la Table, right? I don’t think I’ve known anyone who doesn’t like Sur la Table. I can be at their store and browse for hours. I usually shop alone because I know Chris gets bored after 20 minutes. So today, I’m giving away a $50 gift certificate card from Sur la Table. UPDATE: This giveaway is now closed. The winner is Betsy @ Baking & Brewing (#2). Congratulations Betsy and thanks to everyone who entered! “Like” Uni Homemaker on Facebook. Leave a separate comment on this post letting me know you have liked the page. Follow @unihomemaker on Twitter. Leave a separate comment on this post letting me know you are following. Follow Uni Homemaker on Pinterest. Leave a separate comment on this post letting me know you are following. Follow Uni Homemaker on Google+. Leave a separate comment on this post letting me know you are following. Click on the “Share” link on Uni Homemaker‘s Facebook page and share this post. Leave a separate comment on this post letting me know you shared. This giveaway ends Monday, March 18th, at 11:59 p.m., PST. The giveaway is open to U.S. residents only. Be sure to use a valid email address when submitting your comment(s). Winner will be selected randomly and will be announced on this post. I will email the winner and if the winner does not respond in 48 hours, a new winner will be selected. Best of luck! *** Note: This is not a sponsored giveaway. Just a gift from me to you because you rock! Preheat the oven to 350 degrees F. Grease two 8-inch loaf pans. In a large bowl mix together 2 3/4 cups of flour, baking soda, salt and ground cinnamon. Set aside. Using a stand mixer (or mix by hand), beat eggs, bananas, yogurt, canola oil, peanut butter, sugar and vanilla extract until well blended. Slowly pour the flour mixture into the banana mixture and beat until just moistened. Toss the bite sized peanut butter cups in the remaining 1/4 cup of flour (to help prevent sinking) and stir into the batter along with the dark chocolate chips. Divide the batter evenly between the two loaf pans. Arrange the peanut butter cups over the batter, 10 cups each loaf. Bake for 55-60 minutes or until toothpick/tester inserted into the center comes out clean. Let the bread cool in the pan on the cooling rack completely before serving. Note: You might want to loosely tent the bread with aluminum foil 30-40 minutes into baking, as it can brown quickly. And I’m following you on Pinterest as KateD. I’m making your Kahlua Dark Chocolate bars for a bake sale this weekend. I’m so glad I found your blog! I could surely use a new thermometer and a decent chef’s knife. Now I am following you on Twitter. I’m following you on Pinterest as well. And I now follow you on Google+. I love Sur la Table! I haven’t came across anyone who doesn’t like to shop there. If I won, I would get a pizza peel there to get ready for my pizza making production! hahaha…Thanks for hosting the giveaway. “Liked” Uni Homemaker on Facebook. Last but not least, I shared your post on Facebook. 🙂 I look forward to many many more 100s from your site! Congratulations on your 100th post! If I won I would like to buy the Breville Rice & Risotto Maker. Thanks for your giveaway. I love your banana bread, looks so delicious! Liked Uni Homemaker on Facebook. Woo!! Sur la Table is definitely one of my all time favorite stores. I can’t even begin to think of what I’d do with $50 there.. put it towards a new Shun knife purchase? Get a huge marble baking slab for pastries and a pretty backdrop for food blog photos? Walk away with some pretty white porcelain dishware? The possibilities are endless! I would love one of the designer mats. whoa! This looks so delicious. Congratulations on your 100th post! I love every post of yours which I have not missed. Cheers! I would buy a new chefs knife! Wow .. That’s so cool of you to do!!! I would put it toward a Breville juicer or maybe a pizza stone. I would buy a rolling pin…because after all this time I’m still using a drinking glass to roll dough! I’d probably also get some cute tabletop items to use for my food photography! I have been obsessed with Sur La Table for years. I would buy a gift for my friend Gail who loves to bake! 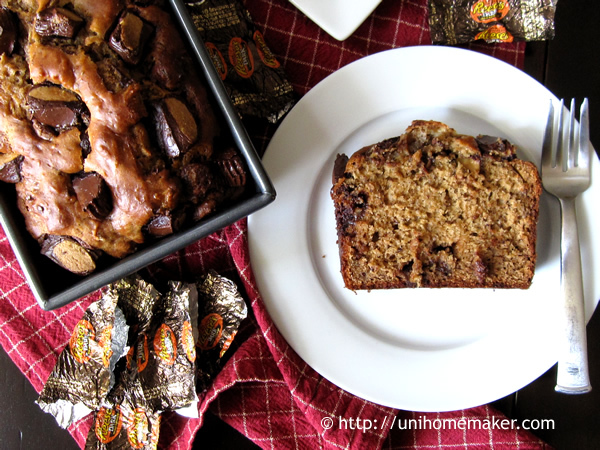 I love your banana bread photo! I would buy the pans to make this bread! Big congrats on your 100th post! This dessert-bread sounds scrumptious! I’m so glad I stopped by in time to enter the giveaway, too! 🙂 I would use the gift card for a food mill or a pie plate, because I don’t own either one. And subscribed to this blog because I like you. Wow…oh wow… oh wow – this looks awesome!! Question – I don’t think they sell muscovado sugar here in the States. (I used to be able to buy it when we lived in Malta.) Do you think I could substitute regular white sugar? If you can’t find it, substitute it for light brown sugar.